You'd think Microsoft would be running the other way after Windows RT's failure, but the company mentions low-power ARM chip support in a new job listing. Microsoft may revive its efforts to run Windows on ARM-based processors with this year’s upcoming Redstone update. “Windows across all device categories is readying for the introduction of 64 bit computing with the ARM instruction set (ISA),” a new Microsoft job posting says. Responsibilities for the job include building a “plan for ARM64 aligned with the Redstone wave.” This refers to a major Windows 10 update that will arrive in two waves, one in June and one in October. The candidate will have to work across Microsoft groups including Windows Device Group, Server, Office, and the Developer Division. As Petri notes, this isn’t the only sign that Microsoft is reviving its Windows on ARM efforts. Earlier this week, a mention of ARM support for Windows 10 desktop turned up in a support documentin Microsoft’s developer portal. Although Microsoft quickly scrubbed the reference, the new job posting suggests it wasn’t a fluke or mistake. Still, the prospect of running desktop Windows on ARM devices is surprising given how spectacularly Microsoft failed the first time with Windows RT. Although ARM chips are generally more power-efficient than x86 chips from Intel and AMD, Windows RT’s inability to run desktop software was a major hindrance, especially as x86 devices began to close the efficiency gap. 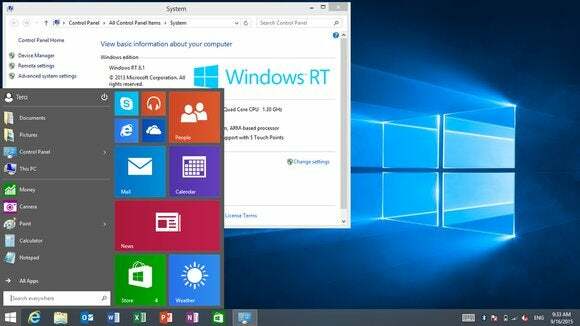 With the upgrade to Windows 10, ARM-based devices such as Microsoft’s Surface RT and Surface 2 tablets got left behind. Today, ARM only runs on the mobile version of Windows 10, aimed at phones with screens smaller than 8 inches. The story behind the story: On some level, continuing to bet on ARM makes sense for Microsoft. The architecture is becoming more powerful while retaining excellent battery life—as demonstrated recently by Apple’s iPad Pro—and Microsoft might not want to be stuck without an answer. Still, it’s unclear how the company will get over the hurdles of limited app support and muddled product messaging that plagued Windows RT. Whoever gets the job faces an unenviable task.